If we’re to believe books, TV and movies, the life of a lawyer is all about dazzling court performances, stunned juries and people screaming “you can’t handle the truth” from the witness box. But how much is fact, and how much fiction? Just for fun, let’s look at some famous movies and see how they stack up against the realities of the law. The story: It’s the cornerstone of every legal drama. 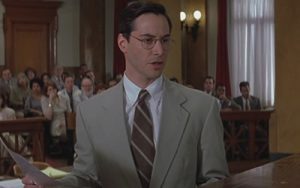 The brash young lawyer, his case in danger of falling apart, must pull it all together in a closing argument for the jury. He struts about the court, calm at first, but a commanding presence none-the-less. The drama builds as he lays it all on the line. Pieces of the case fall into place, suspects ruled out and strange new evidence introduced. Was it the butler, the jilted lover, or, heaven forbid, the Vicar?! No! It was the grieving husband all along! He’s not even on trial, but we’ll lock him up anyway! With more twists than the Monaco Grand Prix, it’s a wonder court trials aren’t a spectator sport. In reality: There’s no way to sugar coat it. Court trials can be really boring to the casual observer. It’s more like a game of chess by post than 20/20 cricket. These complex proceedings rely on process, the subtleties of language and its interpretation and meaning, which is why they can seem slow and very deliberate. Other times, a trial is over in a flash because a matter can be decided quickly. It’s important, extremely skilled work. Unfortunately, trials wouldn’t make great entertainment without a lot extra drama thrown in. Also, it’s worth nothing that the United States – where most of our TV and movies come from – has a very different legal system to Australia’s. In the US, some judges and prosecutors are elected, and cameras are allowed in many courts. Juries also have the ability to determine criminal sentences, and award damages in civil trials. This has helped – in part – create a system that plays to an audience. In Australia, cameras have been excluded from most court proceedings. This might seem odd in a world where nothing is private anymore, but it’s a rule that has, among other things, protected the integrity of our court processes. That means our courts don’t make great entertainment, but our system works. For the most part, our courts are open to the public, too. So if you want to see what a major trial is really like, you can actually sit in. Speak to the court sheriffs on the day to see what’s available, as some cases are closed hearings.